The aim of this comment is highlight the role played by diets rich in carotene/lycopene on the genesis of yellow-orange skin discolorations. dos Santos VM. Yellow palms and soles – more than single discolorat. Russian Open Medical Journal 2015; 4: e0404. I read the well documented case study by Chiriac et al., published in Russian Open Medical Journal 2014 (volume 3, issue 1), about yellow palms and soles in a child with hyperlypoproteinemia type 2A, in absence of diabetes mellitus or hypothiroidism, and no evidence of high levels of beta-carotene or lycopene . Except for skin discoloration, physical examination was unremarkable and the patient did not complain of neurological or visual disturbances. The authors emphasized general features of childhood hyperlypoproteinemias and reviewed most important factors of the yellow skin change. They also focused the main causes of carotenemia in special affecting children and babies, secondary to excessive intake with foods or juices . 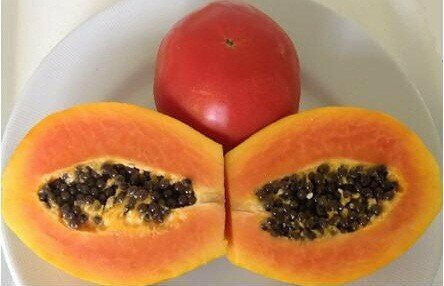 Despite the excellence of the mentioned paper, other common sources of flavonoids should be added in case reports from developing countries, mainly if xanthoderma affects adulthood and elderly groups with elevated daily intake of papaya and tomato richs in vitamin A and flavonoids . In fact, we observed similar yellow discoloration of palms and soles in a 69-year-old Brazilian woman presenting with neurological symptoms . Worthy of note she had an invasive breast cancer, which was controlled by surgical procedure followed by use of tamoxifen during five years; in addition, she had been informed about the favorable effects of fresh fruits and vegetables on the quality of life as well as in cancer prevention . Furthermore, because of a chronic tendency to intestinal constipation, she enhanced the daily ingestion of papaya and tomatoes (Figure 1), which are well-known predisposing factors for occurrence of yellow-orange discoloration of the skin without any change in the color of mucosa. The breast cancer of the patient was controlled by longstanding use of tamoxifen, which has potential effects on the brain higher functions . Therefore, our initial major concern was about alterations in central nervous system due to late cancer metastasis or drug adverse-effect . Except for the skin discoloration her physical examination was normal, and routine laboratory determinations were unremarkable on admission. Moreover, neurological evaluation by electroencephalography (EEG) in addition to computed tomography and magnetic resonance of the brain revealed normal findings. The cutaneous cosmetic changes gradually faded in intensity and finally disappeared after total absence of papaya and tomatoes in her diet. Currently, she remains asymptomatic and eating a well balanced diet, including a variety of green, yellow, orange and red vegetables and fruits. Figure 1. Papaya and tomato were the carotenoid-rich foods ingested by the elderly patient in excess of the recommended daily intake. Notice the numerous seeds of papaya, which are often ingested with additional purpose of laxative effect, and they are rich in vitamin A too. In the elderly woman herein commented, neurological manifestations were associated with disturbances secondary to hypervitaminosis A . Complete characterization of this challenging entity depends on clinical suspicion and specific determinations in blood and in cerebrospinal fluid. Infortunately, in low income countries, technical and economic limitations hinder to get the respective titers of vitamin A and beta-carotene [5, 6]. Russian authors have focused neurotoxicity by Vitamin A or beta-carotene antioxidant compounds that may be harmful if ingested in excess [2-6]. Prolonged excessive intake of these compounds may propitiate interference with loss of equilibrium in some natural antioxidant mechanisms . Russian researches highlight risks of high intake of vitamin A and beta-carotene in adults , while in developing countries the harmfull effects on the central nervous system are often described in children [5, 6]. Perera et al. (2014) reported intracranial hypertension in a child with carotenemia . Mawson (2013) discussed the hypothesis of interaction between dengue virus and retinoids in the pathogenesis of dengue hemorrhagic fever . This issue is growing in interest because dengue fever has become epidemic worldwide, with more severe features in older children and adults . Xanthoderma may herald hypervitaminosis A in young and old people. Thus, vitamin A must be prescribed with rigorous criteria of indication and unfavorable effects have to be monitored . Scientific researches and case studies about vitamin A and flavonoids can contribute to clear controversial idiopathic intracranial hypertension, modulation of body defenses, prevention of cancer, and mechanism of hemorrhagic dengue [4-7]. Jacinto T, Rego H, Sousa C, Sobreira I, Gonçalves J, Lima L, et al. Intracranial hypertension associated with high serum vitamin a levels. Acta Pediatrica Portuguesa 2014; 45: 151-154. © 2015, dos Santos V.M.